Believe it or not, this is not sweet chocolate cherry bread. It would be fantastic with grilled or smoked chicken or ham and honey mustard sandwiches with bread and butter pickles. Chocolate cherry bread also makes great breakfast. I have been perfecting a no-knead formula. Trying out different things, discovering what the dough can and can’t do has led to some interesting discoveries, such as this variation. 2. Hydrate 1 cup tart cherries,drain, fold the cherries into the bread after the first rise. I mixed 1 tablespoon of cocoa into the flour used on the board when folding in the cherries. I did not line the rising baskets with cocoa, just flour. If I keep making this, I’ll invest in some heavy linen cloth to line the baskets so the cloths will get stained from chocolate, not the baskets. 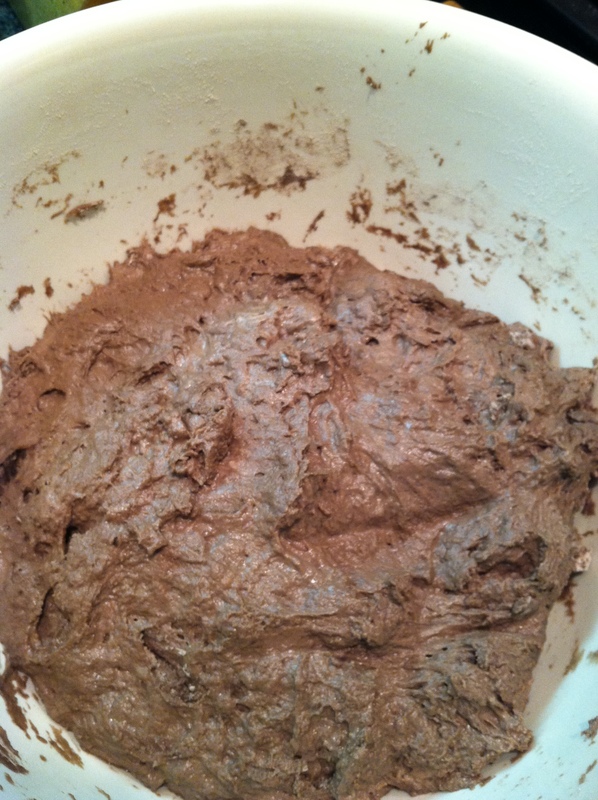 For handling dough: Mix 2 Tablespoons cocoa powder into 1 cup of bread flour. Use this to dust the rolling surface and any sticky parts of the dough as you shape the loaves. 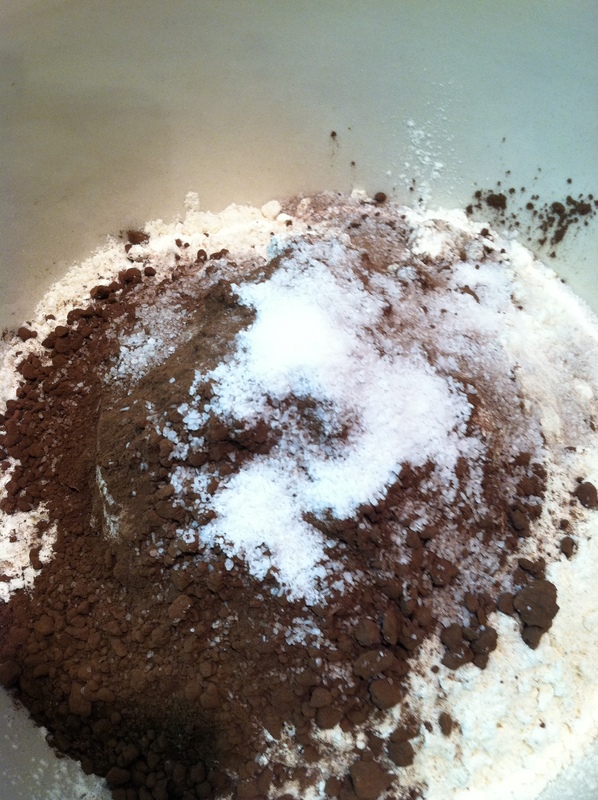 Combine the flour, cocoa, salt in a large bowl, stir to combine. Whisk the yeast and water together and pour over the flour mixture, fold until all liquid is absorbed and all flour is incorporated. 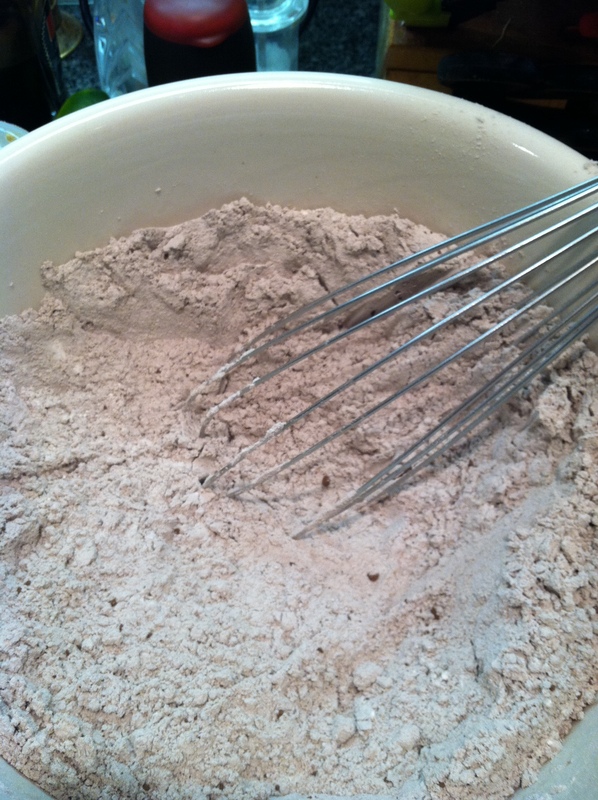 Pour in the wet ingredients and mix until everything is incorporated; form into a ball on the bottom of the bowl. Let rise for 2 hours or double in size. Form into a ball in the bottom of the bowl, cover with an oiled piece of cellophane wrap and allow to rise until doubled in size. This usually takes 2 hours. 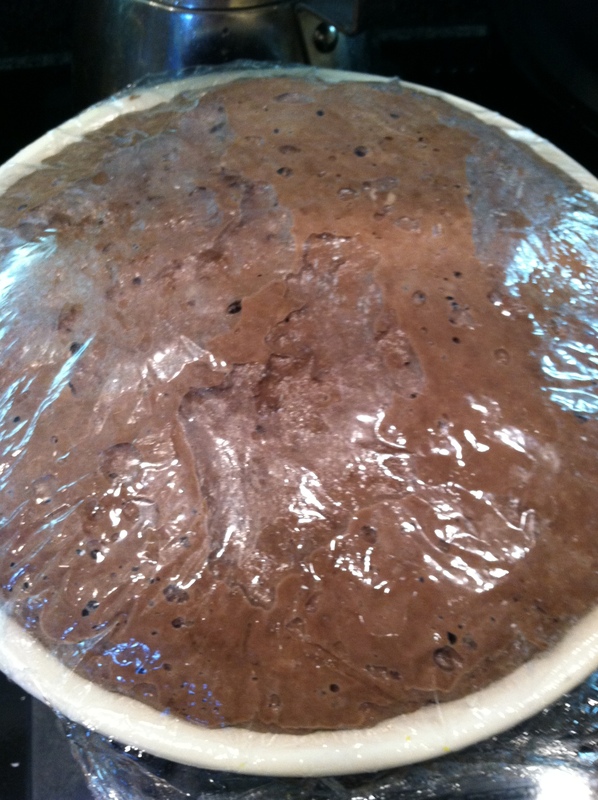 Remove and sprinkle the top of the dough with cocoa/flour mixture, scrape to deflate and separate into equal balls of dough. on a well floured surface, flatten one ball into a rectangle, sprinkle with hydrated cherries and cinnamon sugar if using, fold in thirds, sprinkle more cherries and cinnamon sugar, fold in half. 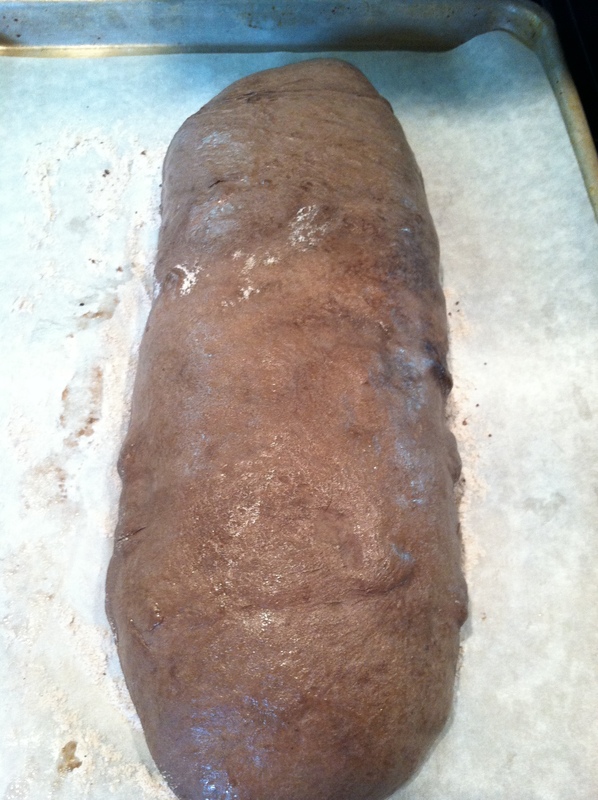 Flatten the dough into another rectangle and roll into a log. Pre-heat your oven to 450°F for 15 minutes before the bread is ready to bake. Slash the loaves and place them into the hot oven for 30 minutes or until the internal temperature of the bread reached a minimum of 190°F. Steaming is optional, if you want a crispy crust, steam is recommended. See how to add steam by reading the No Knead Bread post for a full description of baking off the loaves at home. As I mentioned before, this bread isn’t sweet. Even if you add the cinnamon sugar, the cinnamon adds to the complex flavor of the cocoa and the cherries. Simply divine for a smoked ham or turkey sandwich with whole grain mustard, lettuce and tomato. 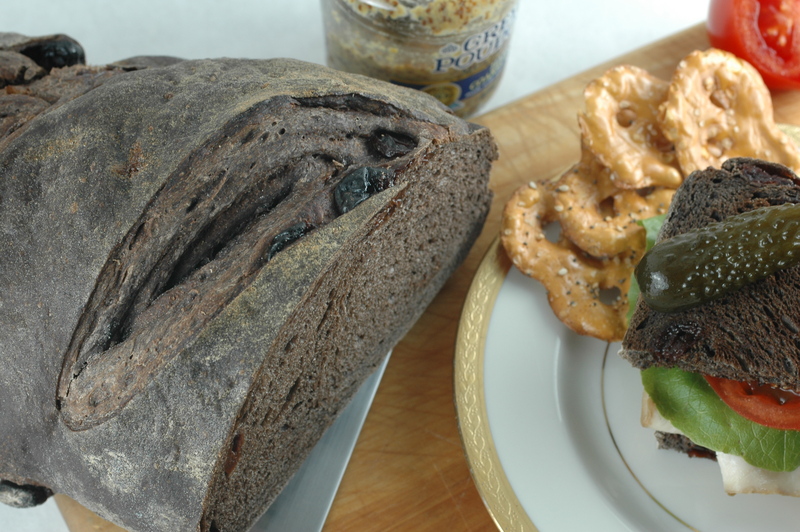 This entry was posted in Recipes, What every good cook should know and tagged Bread, bread and butter pickles, Chocolate Cherry Bread, cook, dark cocoa, Dough, Flour, food, mustard sandwiches, no knead bread. Bookmark the permalink. I wasn’t attracted to this bread at first, but really, it isn’t sweet and it is delicious with mustard and smoke turkey! The cherries are an “inbread” condiment for the sandwich. really have to try this one! did you use the ice-cubes in the end? the loves looks really well-risen and the color is so attractive. really don’t know with what I would have the bread, but, most likely I would go for sweet… nutella or Italian cured meat… what do you think of a salty prosciutto on it? my favorite picture is the one with the dough almost overflowing the bowl 🙂 just love ferments in action! Me too, I love handling fermented dough. Italian cured meat would be spectacular on this. The bowl I used to ferment this dough is an old heavy stone wear bowl that holds nice warmth and cradles the dough while it rises. Dough always respond well when that bowl is used. I didn’t use any steam in this, I wanted to see how it would turn out without it. I think it did just fine.